A Sleepy Orange butterfly at Middle Run Natural Area, 8/23/10. Photo by Hank Davis. As late summer rolls along, there is a great deal of movement in wildlife populations. We often think of the songbirds starting to move south and the Monarch butterflies beginning their long voyage to Mexico, but sometimes there are strange exceptions to the “head south as fall begins” rule. This week at Middle Run Natural Area, our birding group made a unique discovery of an uncommon butterfly from the south. 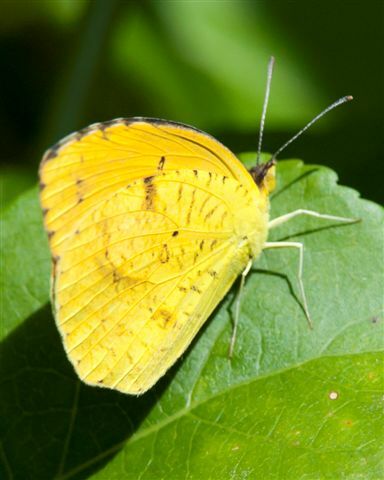 A Sleepy Orange, a member of the sulphur family related the our familiar Clouded Sulphur, appeared along the trail and its brilliant orange upperwing captured our attention. Hank Davis snapped some great photos to document this unusual find. After consulting the field guides, we all had a “life” butterfly to add to our lists. The Sleepy Orange is only rarely seen in our region in late summer, and thus becomes a prize find for us naturalist-types. A Hickory Horned Devil Caterpillar at Middle Run, August 23, 2010. Photo by Hank Davis. Another interesting insect that we came across is this Hickory Horned Devil caterpillar. Nearly four inches long and thick as a finger, this creature with the sinister-looking antenna still has a lot of growing to do. These guys top out at six inches long and will turn a blue-green when they reach they final instar stage of caterpillar-hood. 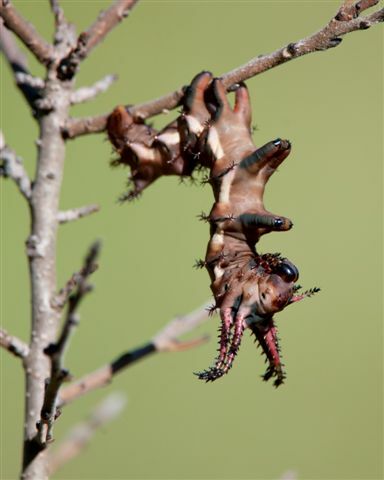 Hickory Horned Devils are harmless, but they sure are a monstrous caterpillar! If you are interested in insects, join us for the second-annual Middle Run Bio-Blitz this Saturday, August 28, from 8:00am until early afternoon. We will search for butterflies, dragonflies, bees, and other six-legged creatures. Join in the fun at Middle Run! We will meet in the main parking lot off of Possum Hollow Road. Last week, we held the first of hopefully many programs featuring Matt Sarver, a local freelance entomologist and ecologist. 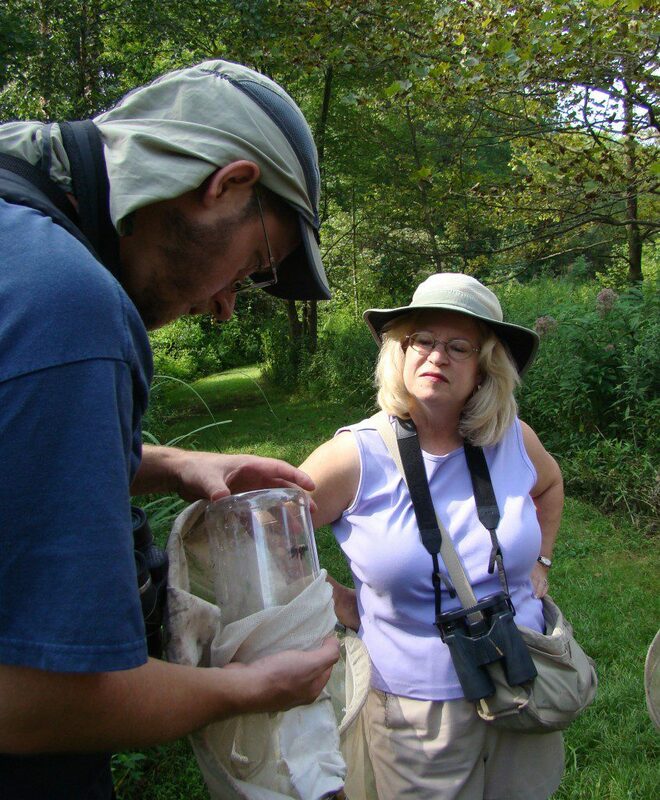 Matt is an expert naturalist and is vice president of the Delmarva Ornithological Society. His program last week at Ashland Nature Center focused on native pollinators, especially bees. Matt is the author of Farm Management for Native Bees and Delaware Native Plants for Native Bees, publications by the Delaware Department of Agriculture. We learned that native pollinators are important for increased agricultural yield, offer a “pollination insurance policy” should the non-native honeybee become unavailable, are themselves extremely important in the web of life, and that promoting habitat for them also improves habitat for a wealth of other species. Matt Sarver examines a bee caught by the group at Ashland Nature Center. Matt focused his introduction and field expedition on bees, but we found many other species of insect pollinators as well. In the field we caught insects with nets and got close-up looks at Sweat Bees, Bumblebees, Carpenter Bees, and Long-horned Bees. We caught Scoliid Wasps, Yellowjackets, Potter Wasps, Flower Flies, and even some butterflies and moths. All of these being important pollinators of wild plants and some crops. 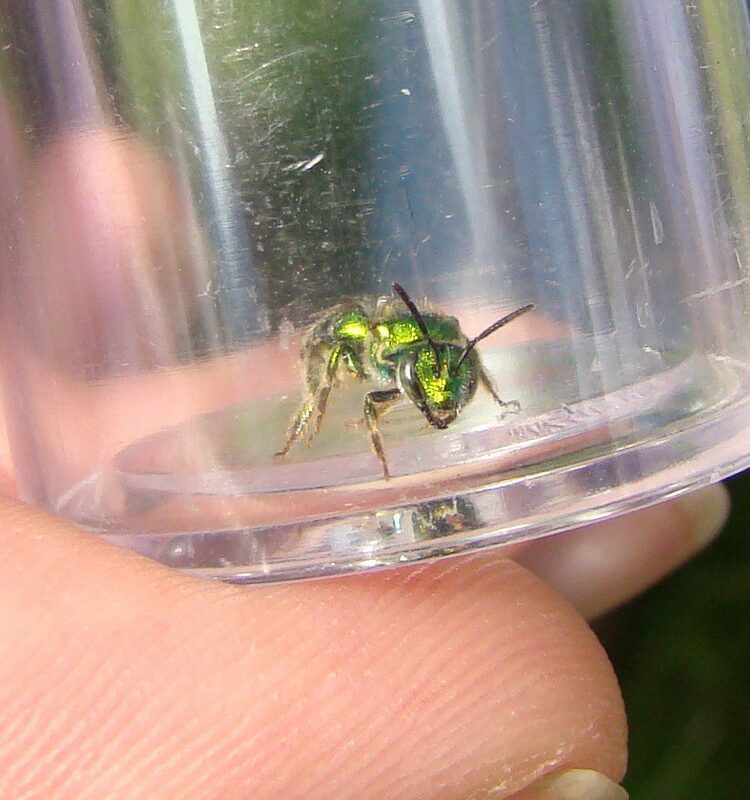 A species of Sweat Bee, an important pollinator that nests in the soil or rotting logs. A bee carrying the white pollen of New York ironweed. Most importantly, Matt shared some ways we can take action on our properties to promote native pollinators. 1. Leave dead trees and limbs when possible. These provide nesting sites for many native pollinator species. 2. Let some areas “go wild”, and designate “no-spray” and “no-mowing” zones. 3. Plant flowering vegetation that is native and diverse. See the Native Plants for Native Bees link above for suggestions. 4. Avoid planting hybrid flower varieties bred to be showy as these often lack pollen and nectar needed by native insects. 5. Provide nest sites such as bare dirt ground, a sand pit or pile, rotten wood pile, and provide a stem bundle or “bee nesting block”. If you have a large property, maintain some areas as native wildflower meadow and establish hedgerows. 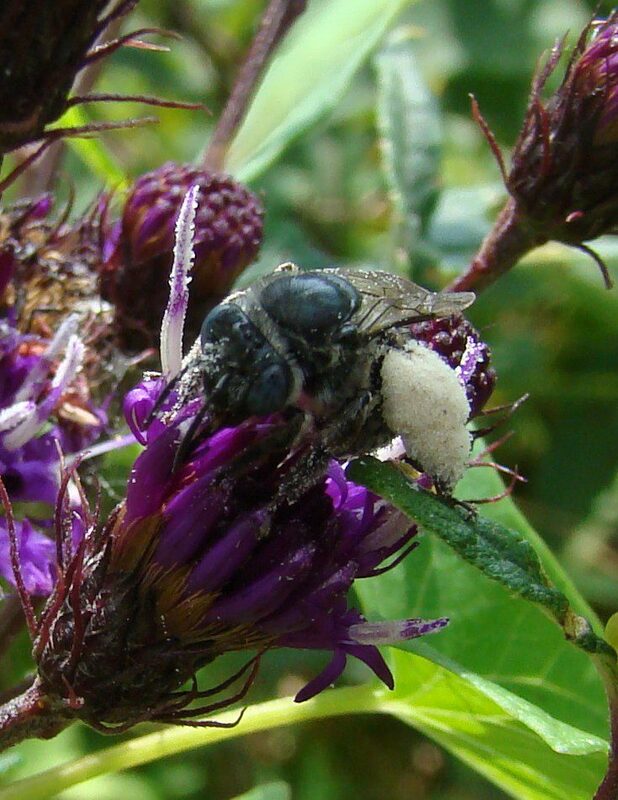 See Matt’s Farm Management for Native Bees link above for more details. All of these actions will make your property more attractive to other forms of insect and bird life as well, and will improve the local ecology. Finally, show the world that you are making a difference by getting a Backyard Habitat Certification offered by the Delaware Nature Society. 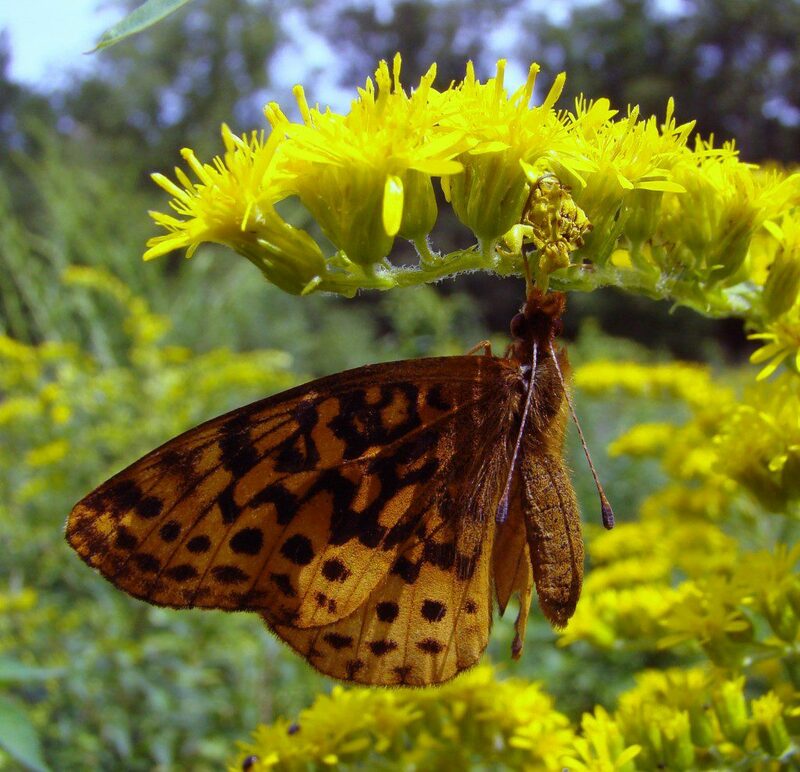 Native plants attract pollinators such as the Meadow Fritillary. In turn, these attract predators such as the Ambush Bug, which has captured the butterfly in this photo. Can you see the Ambush Bug hidden in the Goldenrod flower? Look for future programs featuring Matt Sarver by signing up to receive email notification of Spontaneous Nature Programs offered by the Delaware Nature Society. Each August, the Delaware Nature Society Teen Naturalist club embarks on our annual adventure. Dave Pro, my co-leader, and I love the Adirondacks. It is relatively close to Delaware, and offers boreal and alpine ecosystems, lakes, and some of the tallest mountains on the east coast. This is the fourth year in a row that we have visited New York’s Adirondack Park with the Teen Naturalists. The Teen Naturalists meet once per month for hiking, paddling, camping, wildlife watching, and volunteering for the environment. During the course of the previous year, we have gotten familiar with one another and trained for the challenge of the Adirondacks. 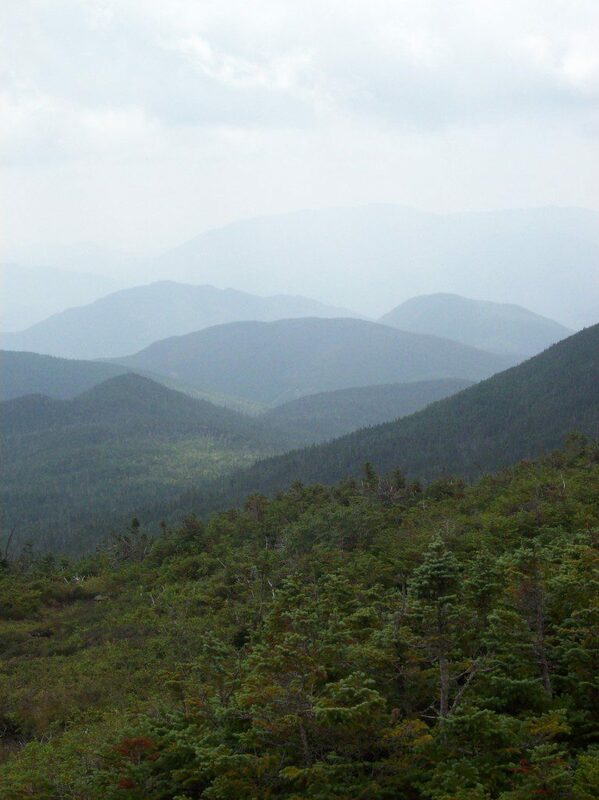 This year, we backpacked into the High Peaks Wilderness, which is an area with over 40 peaks over 4,000 feet. We backpacked into an area called the Flowed Lands and picked a nice campsite near Colden Dam. This is a popular area for backpackers to spend the night and for Black Bears to visit at night. It is also one of the most beautiful areas in the park, with a string of lakes and ponds, and mountains that surround you. We set up a base camp and spent the next few days tackling the summits of Mt. Marcy and Mt. Colden. Hiking in the Adirondacks is a challenge, despite the gentle, rounded look of the mountains. Paths are usually rock-strewn and muddy, and in places, defy the definition of a path. “Bare rock mountain wall” is probably a better term for what we traversed, especially on Mt. Colden. The group enjoyed the challenge of scaling these vertical slopes and pulling ourselves up with hands and feet. Through the week we were treated to some of the best mountain scenery on the east coast, crystal clear streams, waterfalls, chasms of unknown depth, rare alpine vegetation, boreal birds, and yes…Black Bear sightings. I must say, we really enjoyed being visited by a number of bear each night at the campsite…NOT! Even with food, toothpaste, soap and gum stashed in bear cans far from camp, the bruins investigated each night anyway. They weren’t particularly afraid of us, and after shouting at them to scram, they usually just toddled off, sometimes after barking and growling back at us in protest. The growling part isn’t very comforting when you are standing 30 feet from them in the dark wearing just your underwear holding a flimsy stick to defend yourself. On our last night, two Black Bear decided they needed an even closer inspection of our gear. The smell of a forgotten granola bar wrapper in a pack was enough to bring them in, tearing 3 bags, breaking a camera, and puncturing a hole in my water bottle in the process. (The bottle is now proudly displayed on my desk). They woke us three times that night, and one brushed against a Teen Naturalists tent, and generally snorted and shuffled around the campsite. It was a trip we won’t forget. If you have a few minutes, take a look at the slideshow below. Sorry, it doesn’t include bear photos, but does show bear-clawed day-packs. If you know someone who is 13 to 17 years old, and would like to join the Teen Naturalists, registration is open now for the 2010-2011 season. The Russell W. Peterson Urban Wildlife Refuge is a very colorful place at this time of year. See some examples below and come take a look for yourself this weekend. The hibiscus is a water-loving plant that also does well in home gardens. In the marshes of Delaware there are two subspecies, one with a central red spot and one without the red spot. Both can have flower color that ranges from white to pink. 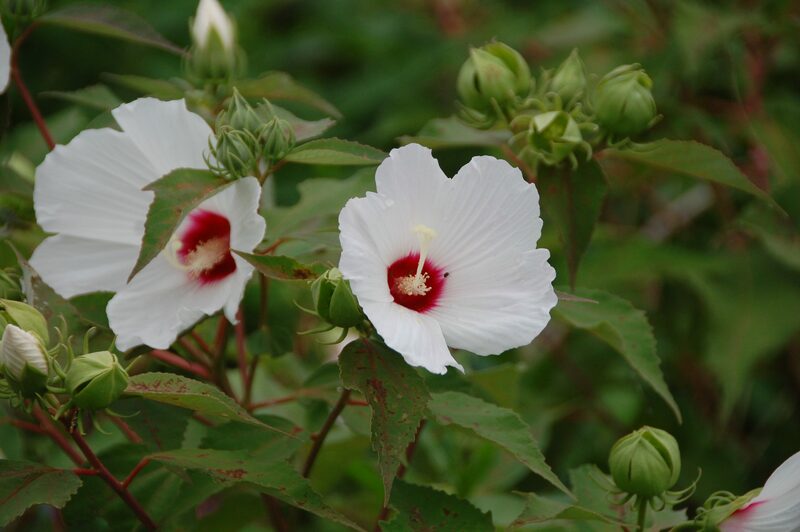 This local hibiscus is also known as marsh mallow, which closely sounds like a tasty treat shared over a summer camp fire. Originally the roots of a European species of marsh mallow were used to make the fluffy, sticky marshmallow. Hibiscus. Photo by John Harrod. Wild rice is another good-looking plant found in the fresh water marsh at DEEC. Standing at 8-10 feet, the chartreuse inflorescences (clusters of flowers) stand out against the deep green sea of the cattails. 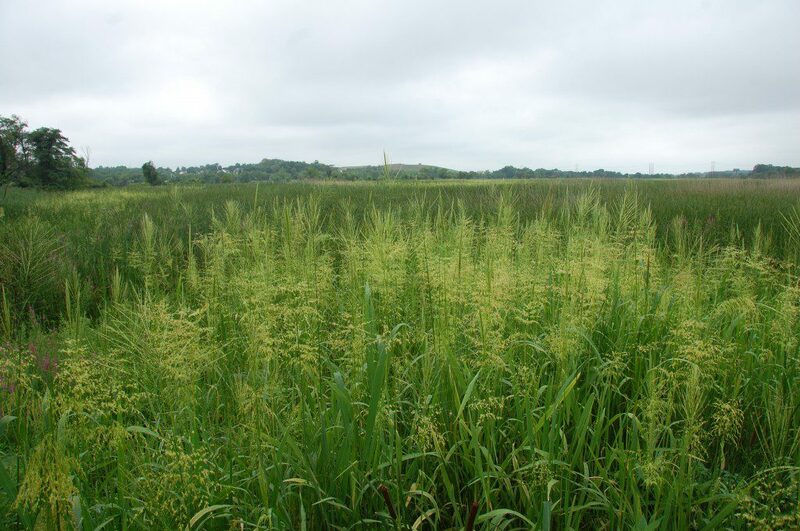 It is a long grain rice that is cherished in the fall by waterfowl and songbirds when it ripens. Wild Rice. Photo by John Harrod. 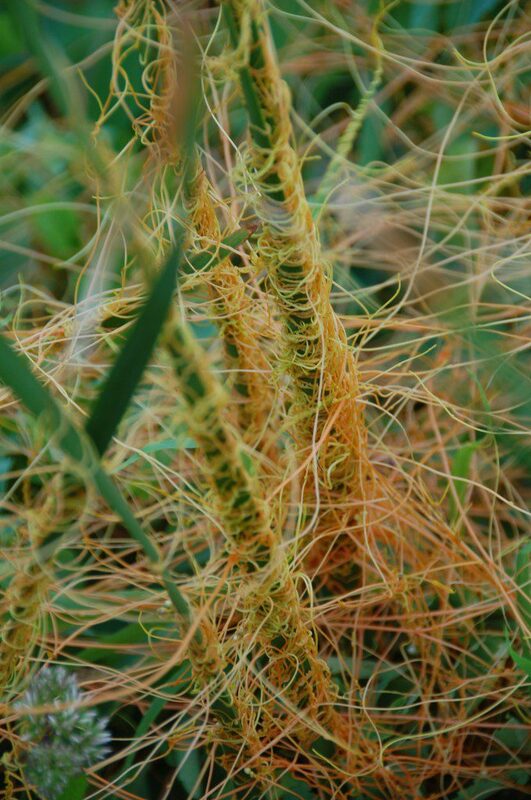 Dodder is a unique native vine that is found clambering over plants near the boardwalk. It is parasitic so it does not need chlorophyll, which is the compound that makes plants green. You see the orange color because the chlorophyll does not hide it, just like leaves of autumn when they lose their chlorophyll, allowing the colors underneath to be visible. Identification is easy…look for the skinny orange vines twirled around green plant stalks. Dodder. Photo by John Harrod. As I cross the bridge to the garden on my way home each day I enjoy the daily song of the Indigo Bunting. Perching on the brush below or the powerlines above, his vibrant blue color is easy to see. 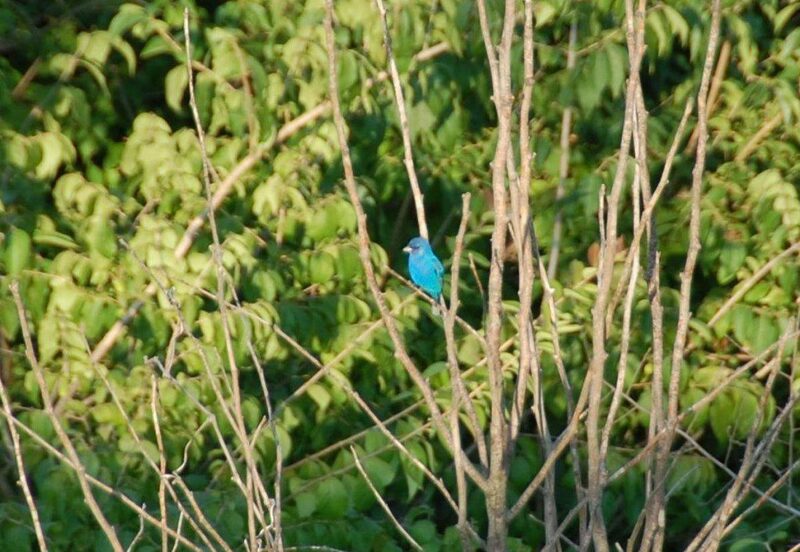 Occasionally, I hear Indigo Buntings in stereo and I suspect that there is a neighboring male nearby. Indigo Bunting. Photo by John Harrod. What colors will you find at DEEC this weekend?